All 3 of these cars were sold in 2005. The Renault and Cadillac stayed in Oregon and the Comuta car took a big trip to Michigan. My desire for selling these 3 cars was based upon several factors. Since 1986, I had been driving electric cars and concluded that a light-weight electric 3-wheeler best suits my in-town commuting. I plan to design and build a "EV 3-wheeler". "the Complete Book of ELECTRIC VEHICLES"
MARS II : 1967 Renault R-10. This 4-seater was produced as one of a series of 42. 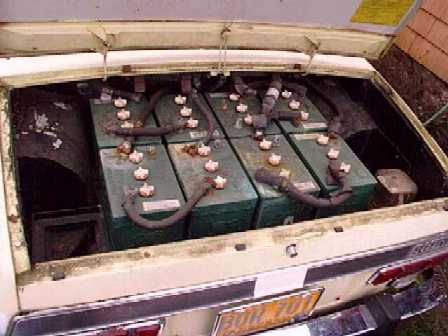 Purchased by Eugene, Oregon's local electric utility ( EWEB ), this car has all of its original components intact. 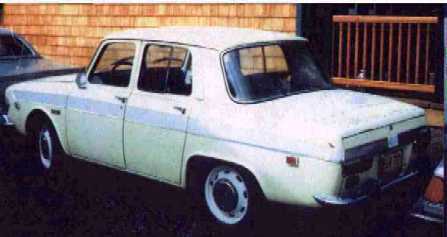 The MARS II production run of 47 was the beginning of the 2nd generation of electric vehicles. This car is most likely the only remaining vehicle with its original equipment intact. Most notable is the MARS II's mechanical controller board that preceded the electronic controllers of the later generations of electric cars. The MARS II is a 120 volt system. This is a photo of the front battery compartment. The original battery charger is pictured in front. This photo shows the rear battery compartment. The car has 16 total batteries 8 in the front/ 8 in the rear for a 96 volts configuration. The car can hold 20 batteries for a 120 volt system. Picture of the instrument panel. This Renault R-10 has a 4-speed transmission. The seats are leather. This B & W photo shows the controller board of the Mars II. Silver contacts and resistors control the voltage of the current going to the motor. COMUTA CAR This 1981 red mini trapezoid coupe was a part of the largest commercial production run of any single EV (approx. 2000 in the production run). Produced by Sebring - Vanguard, this 2-seater run-about is perfect for inner-urban commuting and dash-abouts. This 48 volt COMUTA- CAR has been updated with a state of the art "pulse modulated controller" ( PMC ), which allows for smooth acceleration. 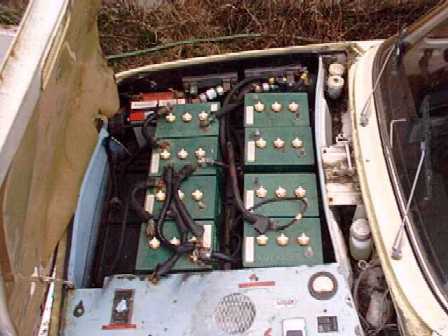 The Comuta-Car carries 4 of its 8 batteries in a box in the front of the vehicle and is a 48 volt system. In the photo at the left, the front battery cover is in the up position (thus explaining why the word are upside down). This photo shows the pulse modulated controller (PMC) that I installed to replace the contact controller that was the original equipment in this car. The PMC allows for smooth acceleration. The Comuta-Car is a two-seater with a small cargo space behind the seats. This car has all of its original parts and components and was last driven by it's designer and owner Robert Aronson. This car is a one-of-a kind masterpiece and needs a minimum of new batteries and a battery rack. Some maintenance would obviously be needed due to long term storage. 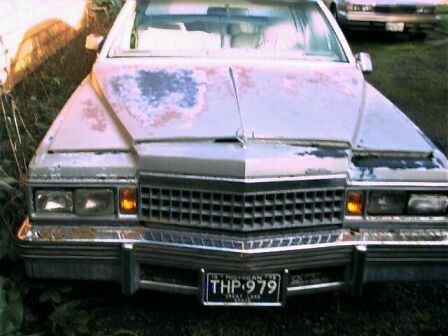 A paint job and chrome work would restore it to mint condition. The plush interior is in excellent condition. Have been told that it has been restored! 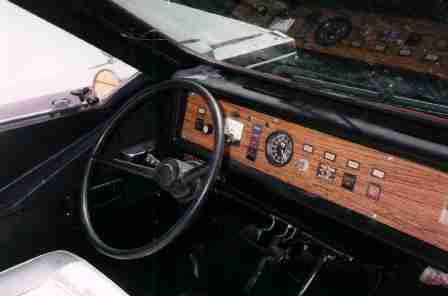 ELECTRIC LIMOUSINE 1978 4-door Cadillac. This car was built and purchased from the same American designer who produced the MARS II ( Mr. Robert Aronson ). The ELECTRIC LIMOUSINE was built with all the amenities of a limousine; a perfect vehicle for chauffeuring dignitaries and groups. This car was the only one produced in its production run, therefore this is a one-of-a-kind vehicle. 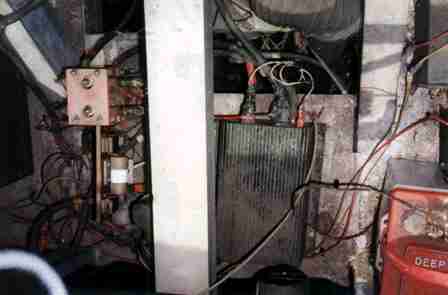 A "silicone controlled rectifier " ( SCR ) powers this 192 volt system with smooth acceleration. This photo is from a series of publicity photos taken in 1979 by The Electric Auto Corporation.